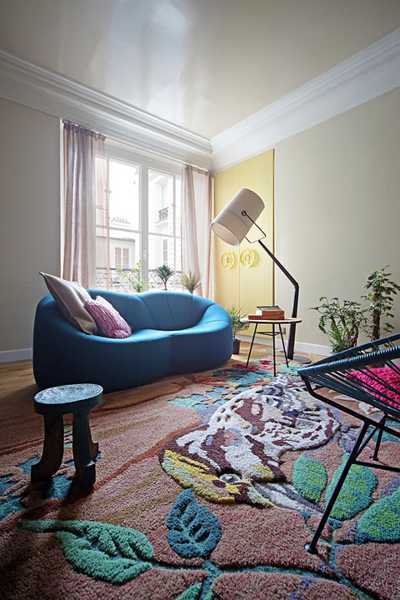 Beautiful, stylish and creative apartment ideas turned a flat in Paris into a fairy tale home. 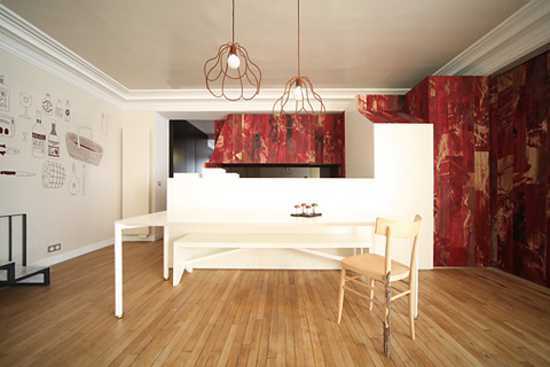 Modern interior decorating ideas are inspired by the tale Little Red Riding Hood and skillfully developed by architects with Italian studio Adelaide Testa in Turin. These wonderful apartment decorating brightens up 60 square meters of living space. Modern interior design and decorating ideas from Andrea Marcante and Adelaide Testa created an unusual and beautiful rooms. 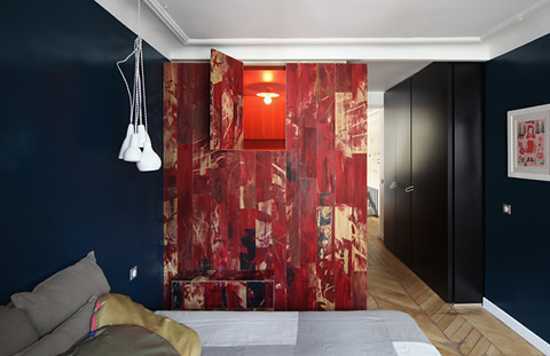 This creative interior design and decorating project was named The True Wolf Wears His Fur Inside, because all innovative and original apartment ideas directly refer to the tale and offer a colorful living space with unexpected contrasts of color and materials. Modern apartment decorating ideas blend neutral color tones with rich color accents, mixing several interior design styles with intricate details. 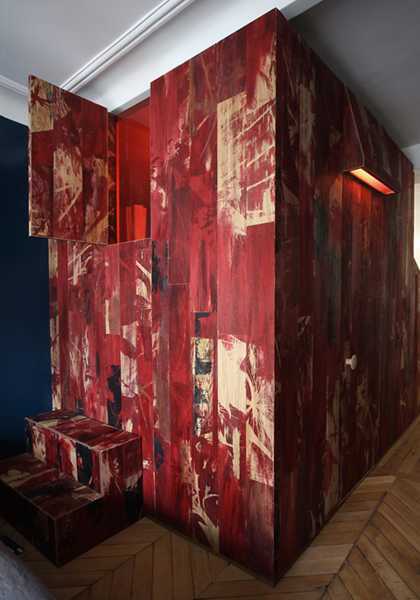 Exciting red pattern on a wooden wall panels looks bold and interesting. The wall panels form an excellent vertical surface that separates the dining area. Cheerful and colorful wall design is attractively contrasting with tranquil living room decor in soft light beige and white and yellow walls and ceiling. The living room furniture pieces are custom made. Comfortable living room sofa offers a beautiful place to relax after a hard day at work. Gorgeous sculpture floor rug make a statement with stunning floral design in matching colors. The bedroom decor feels calm and tranquil. Peaceful blue color creates a sense of serenity. Bathroom design features a wooden wall panels that beautifully match grayish blue color of walls, creating a quiet and relaxing small interior.